It’s all about focusing on your “Core 3” – the needle-movers in your life and business – at this time of the year! Identify what’s working, and double down on those things. This is a MUST WATCH episode about how to accelerate your achievement by the end of the year. Identify what’s working (and focus on those things! ), know which projects to quit and table until 2019, and deliver excellence! My blog readers get a complimentary copy of my new book High Performance Habits, while supplies last! I bought 1000 for you – so no charge for the book itself – but I do ask you pay your shipping. While supplies last. Get yours here. Three Online Courses for $1! My blog readers also get an exclusive $1 trial to access ALL my personal development courses! Click here for the #1 trial. Students call it “the Netflix of Personal Development.” You’ll call it the curriculum that changed your life forever! I’m releasing a new podcast in coming days. So watch my Instagram for announcement. I give weekly prizes, gratitude and shout-outs to our students, so post a screenshot or video on Instagram and use #TheBrendonShow! I can’t wait to hear your thoughts about this episode! Recently I did a long training on what we call “Mid-Year Acceleration Strategies”. This training covers how to get more stuff done by the end of this year. This The Brendon Show episode includes 4 teaching points from that training! It includes my favorite productivity strategies! And I know you’re going to love it because, this year is almost already over. 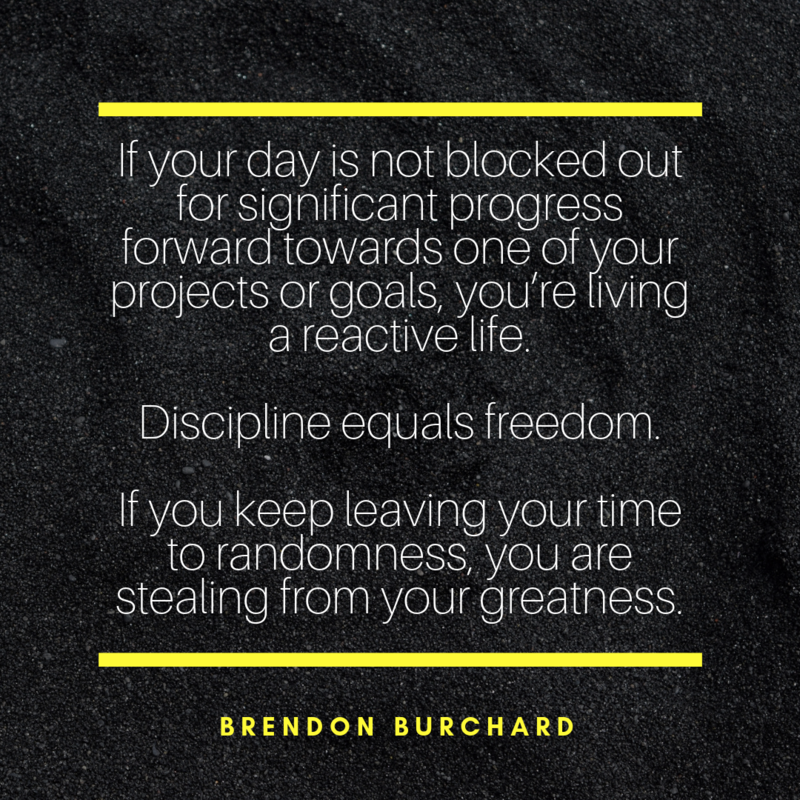 You have a very limited amount of actual work days to complete your projects and make your dreams come true. Enjoy this training, take notes, and go make it happen. Let’s use this as a mid-year check up but also, let’s look at how we can accelerate to the end of the year so that you get so much more done. I love this time of year because a lot of people completely take their foot off the gas. I’m all for going on vacations. We’ve done episodes in Indonesia, Puerto Rico, and Dominican Republic. We’ve been all around, and it’s been really fun. Now, I’m really focused on making sure that I crush it these next couple months because this year’s gone fast, right? So I want to congratulate you for being here. Ultimately, this training is going to be a real gut check to how much you can accomplish in the remaining months of this year. These are five things to help you accelerate your achievement by the end of the year. #1: The Core 3: Spend one hour more per day on your core 3. I begin this every year. First move: I need to identify the core three things right now that have been bringing me results this year? For example, I’m an entrepreneur, and in my business I ask myself ‘What are the three primary revenue drivers we have right now?’ Because just like you, if you are in the marketing industry space, you’ve probably tested a lot of things throughout the early part of the year, as well as in the Spring and even in the early part of Summer. So my question is: What’s been working (and I mean absolutely working) in your life? What are the three absolute best things that are working for you in your career or your personal life? I want you to know what those three things are and overall, I want you to give an hour every day MORE to focusing on one, two, or three of those things. So, let me give you an example. Right now in my business, one of my Core 3 is our book funnel. As an author and a trainer, when I sell books, that’s good for the business. We sell books, and then people want online courses, and then they want to come to our seminars, and then someday they might join our monthly program or our Masterminds. They might hire us for coaching. They might hire me for speaking. But the book is a big Core 3 for the business. I need every single day for the rest of this year, to give more time to that thing. Every day (not only Wednesdays, not on Saturdays), I need to check on the numbers, create a new ad, flip out a page, and I need to lead my team better on it. I do something every day for that one thing. So if you have three things, I want an hour more every day. That might mean three blocks of 20 minutes per day. So you give them 20 minutes more each day, or maybe you just choose one and you’re going to give that an hour more a day. I want you to start this today. I often call it the Core 3 or the needle movers – the primary three things that are working. Spend an hour more per day for the rest of the year on your Core 3, and you will thank me for the next decade. Because what happens is, you’re getting caught up in distraction. And so right now, people are lackadaisical, and they’re not focused on the right things. So I want you to look at where you are distracted. I want you to clear out distractions. I want you to say the core three things in my business are _______, and I need you to give an hour more a day on those. That’s it. If you’ll start that now, and you’ll punch in that hour more every day until Thanksgiving, I promise you, your Christmas will be unbelievable. People are always surprised at how my team and I SWAT team the Fall. We do five events. We’re out on the road. I’m totally booked. I’m slammed in September. But I always know that in the Summer. I start thinking, ‘What are the main things?’ And while I get slammed in the Fall, just like you, for the holidays and for the business or the traveling or the conferences, I’m able to do all that because right now, this time of year, I identify what’s been working and I double down on those things, giving them more of my time. Maybe you’re a Certified High Performance Coach, or a business coach or a life coach, and you realize that you’ve been doing this one thing that’s been giving you most of your clients. Well, that would be one of the Core 3. Do that more an hour a day, and then thank me two months from now. There are two parts to the Core 3. You need to identify your Core 3. 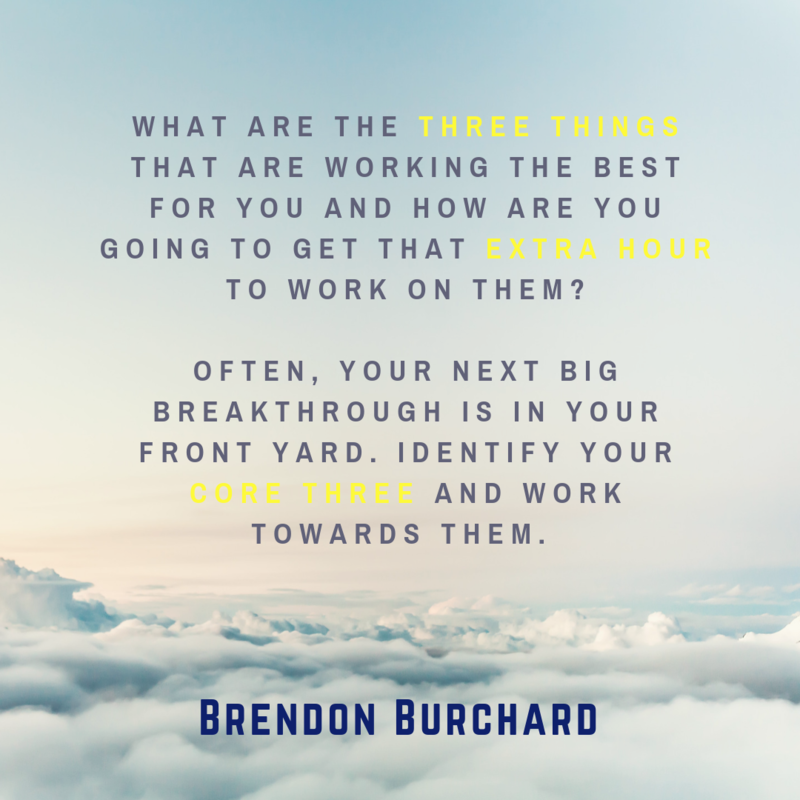 What are the core three things that are working the best for you, and then how are you going to get that hour per day, and how are you going to divvy that up? Is that one hour more each day, or 3 time blocks of 20 minutes for an hour a day? Are you going to focus on Week One, doing an hour a day more on this Core #1, and then next week, one more hour a day on Core #2? I don’t know what it is for you, but block out that hour. #2. Significant Growth Rule: I look at everything I’m doing right now for my business, and I evaluate my projects: of all these things I’m doing, which ones will lead to significant growth this year? Everything else, I start pushing out on the calendar. Whether I push it out two, three, four months from now, or I push it until next year, I do a real close look at all of my activities. I look at my partnerships and my relationships. I look at everything I’m doing in terms of marketing funnels, brand building, what I’m doing in the marketplace, and I ask myself which projects within these things are leading to significant growth? If it is not leading to significant growth, I need to minimize that time. What’s the difference between the Core 3 and a Significant Growth Rule? The Significant Growth Rule applies to the rest of the year, while the Core 3 includes things you’re already doing. All these new ideas people are going to give you and put on your plate in the Fall go into consideration within the Significant Growth Rule. Everyone is going to give you some more things to do, right? There’s going to be new opportunities. And with every new opportunity or every new idea, your thing has to be this time of year. Will that lead to significant growth this year? If it is, maybe you can add that on to your work load. Remember, I’m just asking for an hour here. Maybe you can add that on. But if a project comes your way and it doesn’t lead to significant growth at this stage of the year, and it won’t lead to significant growth for the rest of this year, then move it off your plate into the next year. Significant growth is a way for you to prioritize and say ‘No’. I don’t want you taking on any new projects at this stage of the year if you don’t believe they’ll lead to real growth by the end of the year. It’s that old story of acres of the diamonds. People travel all around the world looking for the treasure and working so hard, looking for the new new thing. And then they come home and one day they put the spade in the backyard and they dig up some diamonds. Often, your next big breakthrough is already in your yard. You’ve probably already met the person who’s going to help you generate your next $100,000, or your next $1 million dollars. They’re already in your network. You’ve already met the right people, but you’re out there searching for new and you’re accepting all these new ideas. As you accept new ideas as a high performer, what does that do? That crowds out other things. From this day forward until the end of the year I want you to have the significant growth rule. Ask yourself: Will this project lead to significant growth by the end of the year? If not, table it. People sometimes say: If I pass up that opportunity, it might not ever come around again. Recognize that things come into your life in waves, in circles and in rhythms. Don’t worry about one day running out of opportunities. You’re ready. You’ve got it. The world is never going to dry up of opportunities on you one day, right? The only way that would ever happen is if your mindset closed out everything because of fear. Have we ever lived in a time of more opportunity? Don’t worry about saying ‘No’ to something that isn’t significant growth for you. Focus on your Core 3 which could lead to significant growth. #3: 45 Day Quit Rule: If this is a major project that I want to do, even if it could lead to significant growth, if I’m not going to start it in the next 45 days, it’s off my plate until next year. And I push it to 2019. For this, I look at all your big project ideas. I don’t know about you, but I have a journal with all my big ideas in it, or my vision board, or I have an Excel spreadsheet of all these different ideas and projects I want to do. For example, I know my next 6 books I’m going to write. I know my next 3 campaigns I’m going to launch. But here’s what I have to force myself to do. If this is a major project that I want to do, even if it could lead to significant growth, if I’m not going to start it in the next 45 days, it’s off my plate until next year. And I push it to 2019. I literally just take it from my journal, and I put it out into 2019, and I feel so mentally relieved. 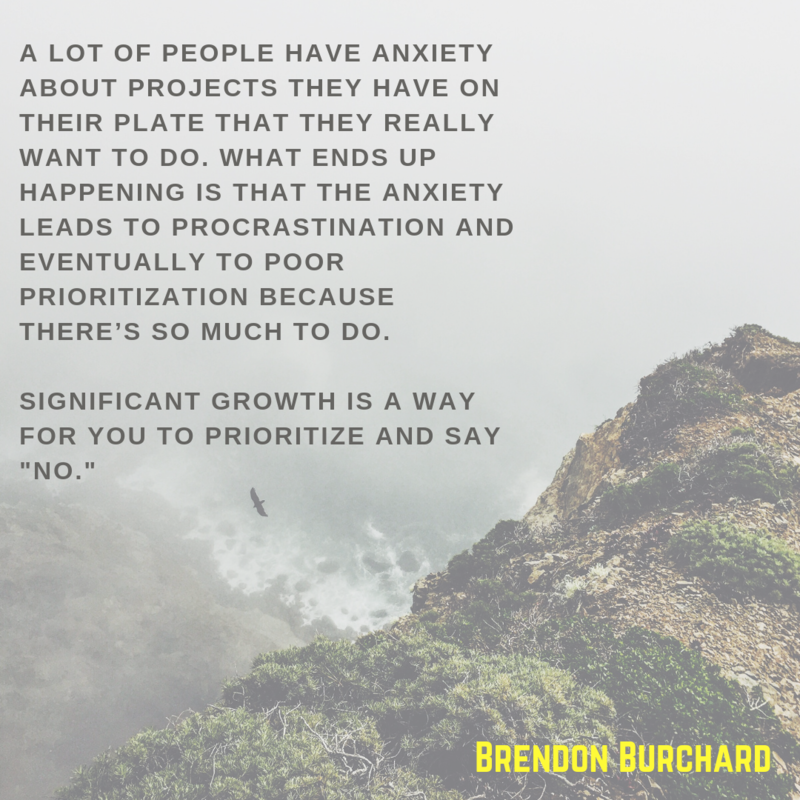 A lot of people have anxiety about the number of projects they have on their plate that they really want to do. And so what ends up happening is that anxiety leads to a lot of procrastination. That anxiety leads to a lot of poor prioritization because there’s so much to do. There’s so much to do here, so you won’t do any of it. You ever had that happen? Have you ever found yourself in front of Netflix going, ‘I have so much to do, but I just watched the fourth video in the third season?’ Has that ever happened? You have so much to do, and that’s the problem. You have so much to do that you haven’t prioritized what you are going to do, so you don’t do anything. So what I do is, this time of year, I look at all those things that are on my plate, and I get honest. Which ones am I going to start in the next 45 days? If I’m not going to start in the next 45 day, I put the project into 2019. Now it’s not even on my mental concern. It’s not on my dashboard. No anxiety there. That’s the 45 Day Quit Rule. I encourage you to challenge yourself to try it. #4: Deliver Excellence Rule: If I take on these projects, would that prevent me from delivering what I already promised, the best that I could? This is another prioritization move for me. Someone throws a big opportunity to me. It could lead to significant growth. I could get it going but it compromises the deliver excellence rule, which is marked by this question: ‘If I take on these projects, would that prevent me from delivering what I already promised, the best that I could? For me, I’m very stretched in my schedule. I have to get a lot done during the day. Big team, big brand, big business, big clients. I must be good. But lots of great opportunities come my way that could lead to significant growth this year, but then the second level of that evaluative tool is to say, if I do that though, will that steal away from something I already promised to somebody I care about or who’s important to our business? Will that make me fail to deliver what I wanted to deliver? And so I have to be honest and I have to prioritize. It doesn’t mean I’m perfect. It just means I work really hard at it. I’m very diligent and focused on it because I have people counting on me. I got you, and I know you got people counting on you, too. So if something comes up and it’s a great idea, but it doesn’t lead to significant growth or you’re not going to start it, then park it. But also, if it is something that you could get going and it would lead to significant growth, but it’s going to screw up what you already promised, don’t break your integrity. Put that thing back in that parking lot. I’ll start it in January. It will give you so much mental freedom to commit to the Deliver Excellence Rule. Your tendency, high performer, to over-commit yourself is actually stealing from your ability to make good choices, to feel the day, to WIN the day. So you have to re-evaluate where you’re at and what you’re doing. Be willing to tell people ‘I’m sorry, but not this year.’ This is the phrase I want you to write down in your journal: Not this year. This is one of my favorite sessions we’ve ever done. So, I look forward to hearing your awesome success stories. I hope you achieve more this Fall than you’ve ever done in your life. 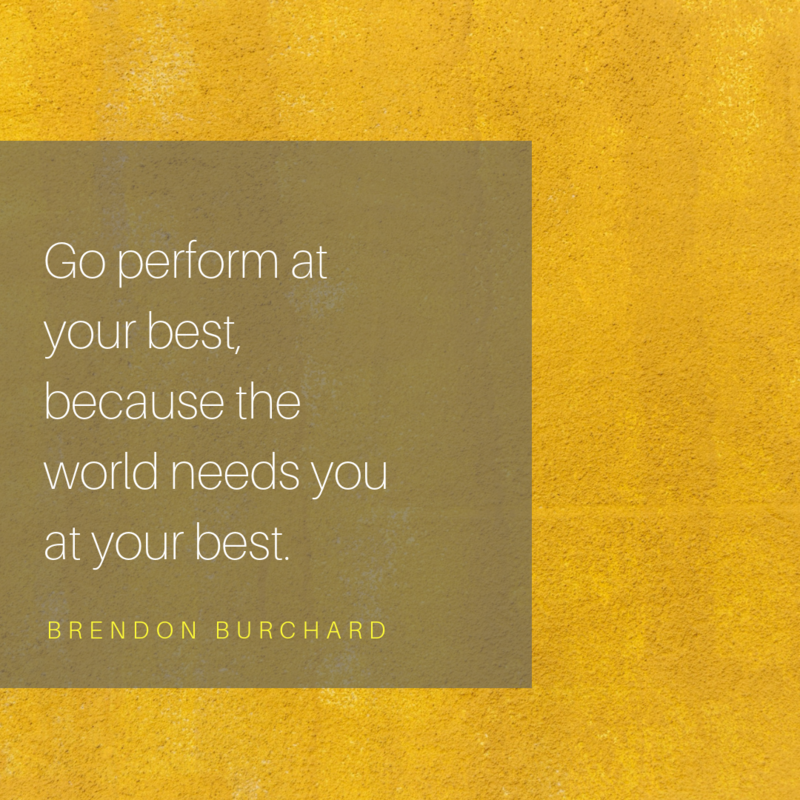 Go perform at your best because the world needs you at your best.